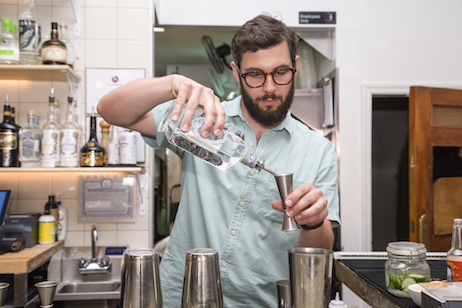 Shapell is the beverage director of Win Son, one of the most innovative restaurants in Brooklyn. Recently I had one of my best Chinese meals in this hemisphere there. It’s a place where the seasoned eater can throw back some Beijing zhajiang mian alongside pork bellies and an oyster omelet. It’s also a place where Chef Trigg prepares fried eggplant with labne and tops it with a gastrique. The menu contains enough authentic Chinese flavors to satisfy the purist, but it also delights and surprises. "It all starts with our awning..."
The drinks list at Win Son also fully embraces the hyphen. Flavors of the East are entwined with a distinctly American cocktail concept. When Shapell joined the team in 2016, he inherited a solid drinks menu developed by Brett Helms. 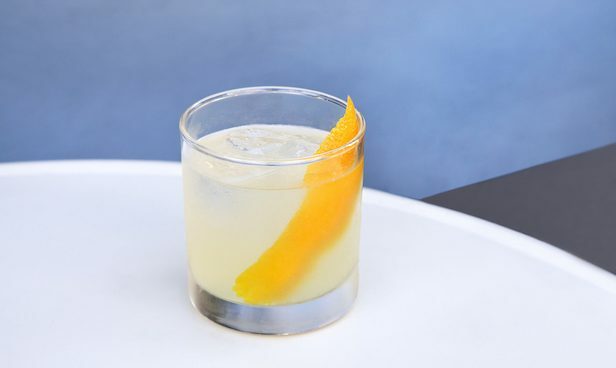 It included offerings like the Vaquero Chino, a chili-infused Scotch sour with Thai basil, and the Breakfast of Champions, which pairs dark rum, peanut milk and toasted black sesame seeds. And did I mention the baijiu? Shots and cocktails, no less. More on this later. A New England transplant, Jesse arrived in New York by way of Ohio in 2010. He had studied Latin at Oberlin, was considering a career as a librarian, and had never worked in the service industry. He reached out to his cousin Lynn Wagenknecht, a successful restaurateur, for a job. She let him check coats at Cafe Luxembourg. Hospitality was a good fit. A year later he started at Barboncino, a busy neighborhood pizzeria, where he worked his way up to floor manager. This was when he was given his first crack at a beverage program, where he was in charge of everything but the wine list. 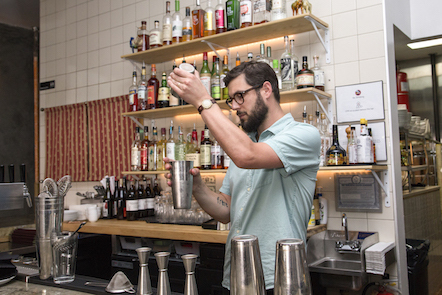 With an range of cocktails, shaken and stirred, he learned to manage inventory and costs, and concocted a few original drinks on the side. His next gig was a couple-year stint as bar and floor manager of Isa, a Mediterranean restaurant with a regularly rotating cocktail menu. There he further developed a taste for funky natural wines and craft spirits with a sense of place. It was around this time that Josh Ku—a friend of a friend from college—began swinging by Isa to pick Jesse’s brain for a restaurant project. Josh is a Taiwanese-American, born and raised in New York. He had teamed up with Virginia-native Trigg Brown to create a fun neighborhood restaurant with a Taiwanese influence that would be affordable, “something that you can repeat and enjoy during a month,” as Shapell puts it. 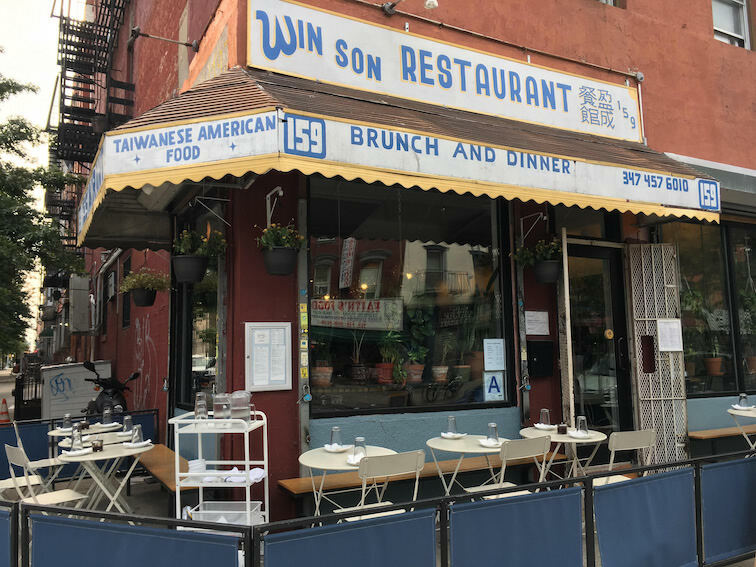 Win Son opened its doors in 2016, right when interest in Taiwanese food was taking off in New York. Its success prompted Ku and Brown to take on a more ambitious program. “They got popular so quickly and that really accelerated what they wanted to do,” says Shapell. They reached out to Jesse, who was then considering opening his own wine bar, and they asked him to come on as a temporary management consultant. Jesse had never worked at an Asian restaurant before. 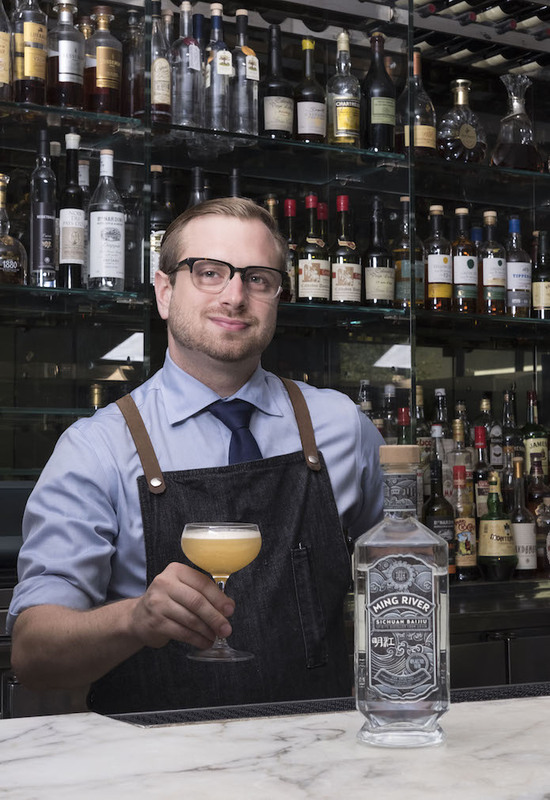 Taking on a drinks program that had great fusion cocktails and “leaned heavily on Taiwan beer,” he overhauled the wine menu. When he left in January 2017 he left things better than he had found them. In September of 2017 the management team gathered for a tasting of Kinmen Kaoliang, a light-aroma baijiu that dominates the Taiwan market. 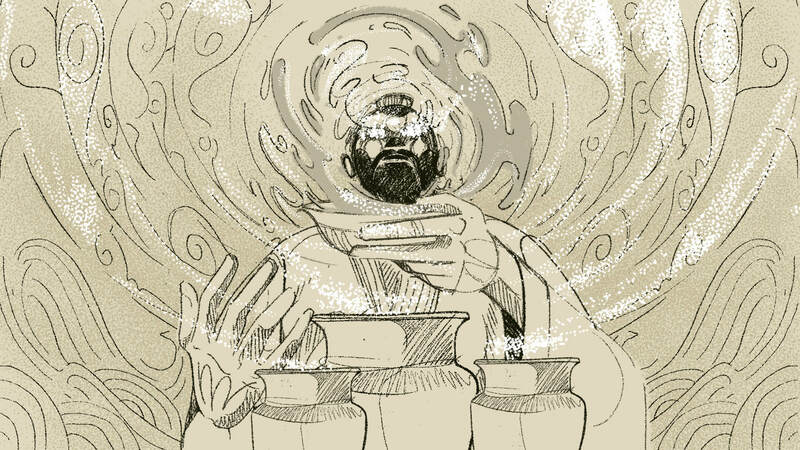 Jesse had never tried it, but quickly discovered that baijiu combined two things he had never encountered before in a spirit: funky flavors and terroir. Kinmen became Win Son’s house baijiu, in both the 58 and 38 percent alcohol by volume iterations. The lower-proof expression was used for happy hour and end of the meal shots, whereas the higher-proof was reserved for cocktails. The first cocktail was a rare case of baijiu kismet. Playing with the herbaceous quality of light-aroma baijiu Shapell’s instincts told him to swap the Kinmen for gin in a summery Negroni riff. 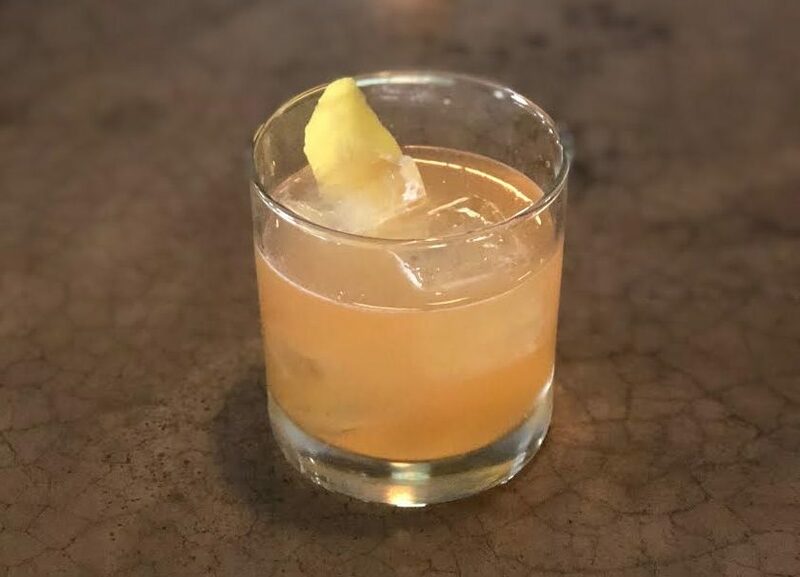 He used a light vermouth and threw in a couple of bitter ingredients, Contratto Aperitif and Cocchi Americano. It needed a little acid so in went the lemon juice and the Kinmen White Lightning was born. More recently Shapell has added the Buddha Bless, a summery sour made with Ming River Sichuan Baijiu and Cap Corse apertif. I was lucky to be one of Shapell’s taste testers, and was unsurprised to learn that it is a strong seller.